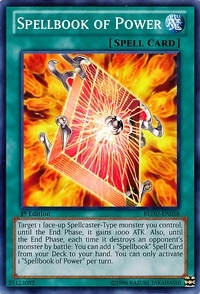 Target 1 Spellcaster-Type monster you control; until the End Phase, it gains 1000 ATK. Also, until the End Phase, each time it destroys an opponent's monster by battle: You can add 1 "Spellbook" Spell Card from your Deck to your hand. You can only activate 1 "Spellbook of Power" per turn. This card’s Japanese name is a reference to the Key of Solomon, which was also known as the Little Key of the Whole Art of Hygromancy. The effect that adds 1 "Spellbook" to the hand when the affected Spellcaster-Type monster destroys an opponent's monster in battle starts a chain. If a Spellcaster-Type monster affected by "Forbidden Lance" is targeted by "Spellbook of Power", neither effect of "Spellbook of Power" is applied. Also, if a Spellcaster-Type monster affected by "Spellbook of Power" is affected by "Forbidden Lance", the effects of "Spellbook of Power" that has already resolved are still applied. : If a Spellcaster-Type monster affected by "Forbidden Lance" is targeted by "Spellbook of Power", are the effects of increasing the monster's ATK and adding a "Spellbook" Spell Card to the hand still applied? Also, if "Forbidden Lance" is applied after applying the effect of "Spellbook of Power", do the effects of "Spellbook of Power" stop applying?